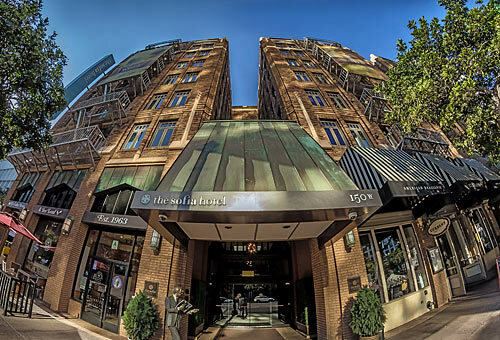 Situated in the Gaslamp Quarter near the San Diego Opera and other top attractions, The Sofia Hotel offers upscale accommodations in a 1926 gothic revival building. Guests can enjoy in-room features, like Wi-Fi (included with resort fee), designer toiletries, flat-screen TVs and more, as well as amenities including a 24-hour fitness center, a yoga studio, and an on-site American-style bistro. Flat screen TV, minifridge and microwave in-room. 24-hr yoga and fitness center. 2 blocks from Horton Plaza. 4 blocks from the Gaslamp Quarter. 6 blocks from the San Diego Convention Center. 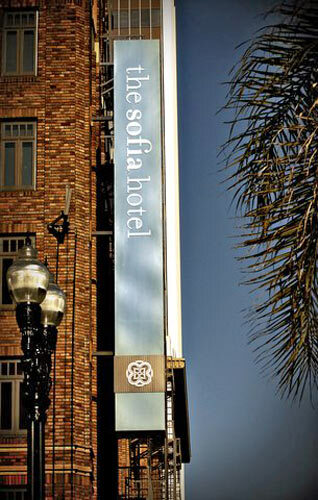 The Sofia Hotel is situated in downtown San Diego at the corner of Front Street and Broadway, near the historic, trendy Gaslamp Quarter. Since opening, there has been an unmistakable impression among the hotel's guests: award-winning service, convenient and modern amenities, and a delightful glimpse of the past - all for the right price. Amenities include access to a well-equipped Health & Fitness Center, Yoga Studio and Business Center. The Sofia Hotel has preserved her 1926 gothic-esque appearance, proudly becoming San Diego's only member of the National Trust Historic Hotels of America. Touches of The Sofia Hotel's history, including historic photos on corridor light sconces, are woven into the property. In the heart of downtown San Diego this historic hotel is 2 blocks from Horton Plaza – 4 blocks from the Gaslamp Quarter – and 6 blocks from the San Diego Convention Center, Cruise Ship Terminal and USS Midway Museum. Retreat-like highlights at the smoke-free Sofia Hotel include a full-service spa and a 24-hour yoga center and fitness center. Business amenities include a 24-hour business center and meeting facilities. Sofia Hotel houses 211 guestrooms with natural influences – down comforters and pillow top mattresses. Amenities include high-speed internet access, flat screen TVs, compact refrigerators and microwaves. Only Valet Parking available for additional fee of $36 which includes in and out privileges. Minimum check-in age is 18. The nightly resort fee due at check-in. Pet friendly: $35 per night pet fee. Please request a pet friendly unit at time of purchase. Have you been to The Sofia Hotel? Share your knowledge and be the first to review this. We stopped at the hotel for three nights and I can honestly say I would never return. Our first night we got into bed to hear a horrible rattling noise, after 20 minutes of it not stopping we contacted reception who told us it was building noise and they could move us to a different floor. The noise was completely unbearable to sleep but it seemed as though it was something they were used to. We then moved to another room on the second floor and continuously had the worst nights sleep we’ve had in a hotel. Other guests would come and go at unsociable hours and you could hear every conversation, argument, Skype call etc as if they were in the room. On the surface it appears a nice hotel but most of the people are stopping are here to party because people were regularly coming in at 2am/3am and had no cares about keeping their noise down. This happened all three nights to the point I couldn’t wait to check out and dreaded going back on the last night. It wasn’t the same room each time as well so it generally had noisy guests and ridiculously thin walls. The street noise was a problem too. The rooms are tiny and cramped too and it’s really tired. The bathroom is tiny and the shower floods all over the floor. The only benefit this hotel has is it’s location but it wouldn’t be enough to ever make me stay again. Even though we have just returned to Canada, we look forward to seeing you again next year. The staff are all so welcoming and approachable which is important to make our Holiday so pleasant. The location is so close to transit that makes it easier to not rent a car. 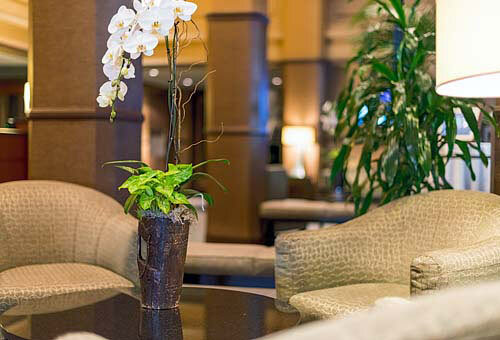 "Great service and location in San Diego"
The hotel' staff was always polite and helpful. The room we stayed was very good. It's on Broadway street, within walking distance of Gaslamp Quarter, Little Italy, Santa Fe trolley station, all major bus lines as well as several markets and stores.